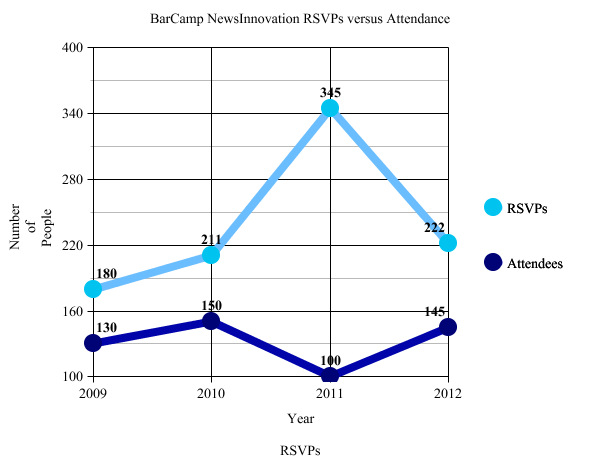 The 2012 BarCamp NewsInnovation was the first to have a paid entrance -- $5 -- which lowered RSVPs and raised attendance from 2011, which likely took on a much larger casual interest from being listed on the Philly Tech Week website. *Also, 2011 and 2012 featured hackathons, which added some attendees overall. These figures do not include them. **I added this graph to this post AFTER the last BCNI. Later this week, I’ll help organize the fourth-annual BarCamp NewsInnovation. It will again be, in my biased opinion, among the most meaningful media un-conferences in the country. We’ll have an open news hackathon again, ProPublica social media editor Daniel Victor will talk strategy and representatives will talk shop from legacy media powerhouses and independent news startups from throughout the eastern seaboard and beyond. That rocks. Beyond all that, the biggest change in format is that, for the first time, we’ll be charging $5 for admission for the day-long event, which includes breakfast, lunch, happy hour and appetizers, in addition to concepts and conversations of note. Though always popular, attendance has been inconsistent and erratic because, we feel, there is little buy-in for a free event. We’re experimenting with the idea that even a modest sum, like $5 — though students and others who would be deterred are welcome to come for free — there will be a higher-rate of RSVP returns. We also think it will help us create a more valuable event, as BCNI continues to grow. It’s been interesting to see others deal with the same challenge. Developer Mark Headd, who recently joined Code for America, sent over interesting insights from others organizing free events. Seems like this might be the right decision.